I remember vividly back when the Riders played the Glory, how the fans swarmed Larry for his autograph. The former NFL Great guard was kind and signed as much as he could after the game. 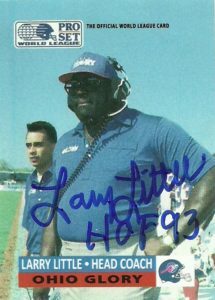 Little was one of the few black head coach at the professional level of football in many years, and it was a big deal- even if it was the WLAF in 1992. While the Glory finished with a dismal 1-9 record, the team was competitive in many contests. While Wild Card and Ultimate both contributed cards to the World League family in 1992, none outside of ProSet made any cards that showcased coaches- and ProSet bailed out on the WLAF market by 1992, so I made my own. Larry played offensive line in college at Bethune-Cookman, but was not drafted in 1967. (It’s not known whether it was an issue of scouting or lack of film, but it was obvious that Larry was overlooked not only by the NFL but the AFL as well.) He’d sign as a free agent with the San Diego Chargers of the AFL. In 1969 Larry was traded to the Miami Dolphins where he quickly distinguished himself. 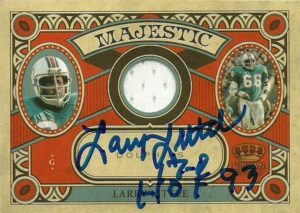 Larry was a key cog of the Miami Dolphins 1970’s dynasty, blocking up front for Jim Kiick, Mercury Morris, and Larry Czonka. He’d be named to the Pro Bowl 5 times (1969, 1971-1974,) and earn All-Pro 5 times (1971-1975) over his career. After retiring from the NFL in 1980, Larry coached at his Alma Mater Bethune-Cookman from 1983-1991, before joining the WLAF with the Ohio Glory. Little was primarily known as a player’s coach. He returned to college after the WLAF went on hiatus, and coached at North Carolina Central from 1993-1998. He’s earned numerous accolades from his playing career as well, being named to the NFL 1970s All-Decade Team, the Miami Dolphins Honor Roll, the Pro Football Hall of Fame in 1993, and The Sporting News 100 Greatest Football Players in 1999. Larry signed these 2 cards for me through the mail. I should’ve actually included the Ultimate WLAF Ohio Glory Checklist but, maybe that’s for another time. I sent him the rest of the WLAF cards that I made for him to keep and he returned two of them, one inscribed with 17-0 and the other with HOF 1993. The photo is of him from his interview with the WLAF Gameday Magazine from 1992 and it makes a solid, if not stoic impression of the former Glory coach. I really have warmed up to the Crown Royale Majestic line of cards from 2010. While the card is very busy design-wise, it almost has a carnival appeal to me, emphasized by the typeface used for Majestic. How Majestic is lined up and off center within the marquee drives me a bit nuts, but otherwise the patch and autograph tie up this card nicely.